The key to cleaning hard-working hands? Goat milk soap that’s handcrafted in small batches on a family farm. This trio of made-in-California soaps combines goat milk with other natural ingredients like olive oil and ground walnut shells for exfoliation. The soap gets tough on epoxy, grease, and other stubborn, stuck-on messes while leaving hands moisturized. It’s great for gardeners, mechanics, DIY-ers, or anyone who wants a natural and effective way to wash up. Dimensions: Each bar: 3.5" x 2.6" x 1.25"
Weight: Each bar: 0.37 lb. Great goat milk soap---perfect for any skin! Helps with all skin problems. Raising goats may be a dirty business, but Humboldt Hands’ Maker Stacey Leaton found a way to turn things around when she began using goat milk to tackle the problem of her husband's perpetually dirty, tractor-greased hands. She tried recipe after recipe until finally landing on the perfect one. She crafts the soaps with her family in small batches on their farm in Ferndale, California, using fresh goat milk and other natural ingredients like olive oil, coconut oil, and ground walnuts for extra scrubbing power. The soaps not only tackle serious dirt and gunk like epoxy, tree sap, and diesel, they also moisturize hands. 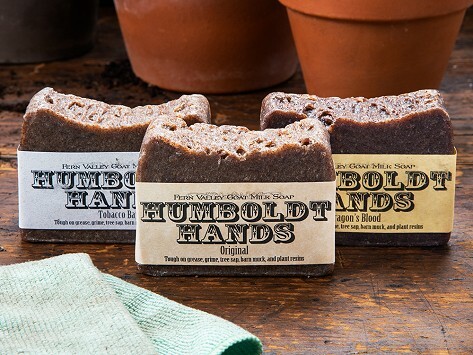 Humboldt Hands soaps were made for folks who work with their hands—farmers, like Stacey’s husband, gardeners, craftspeople, mechanics—but are great for anyone who wants a natural way to clean up.